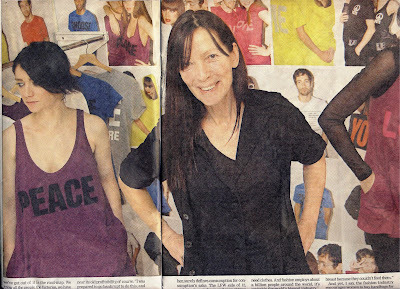 Friday's Evening Standard had a great article about doyenne of green fashion Katherine Hamnett. There is all the usual fieryness we've come to expect from KH, including a tidbit on the Tesco debacle last year and her history from Sloane Street purveyor of glamour to present day ethical fashion champion and critic of mainstream fashion glam and all that goes with it. 1) Journo (having noted that KH thinks fair fashion needn't cost the earth): " But your slogan T-shirts sell online at Pounds 40 a pop ...? KH: "Well, we are a designer brand. That's our main line, and I'm afraid if you want the real thing, that's what you gotta pay for it." (WELL SAID! Why should ethical designer-wear be less expensive than any other kind?? Ethical is about sustainability, production process and fair trade. Its not about charity. KH: "Yes, of course we should all boycott the shops that don't stock environmentally sustainable, ethically made clothes...."
(YAY! Anyone who knows DeviDoll and this blog knows we DETEST fast fashion). 3) Journo thinks that the idea that fashion can save the world (the title of a talk KH gave at the V&A last week) is 'preposterous'. Fashion is about consumption for consumptions sake and if we really wanted fashion to save the world it would simply get designers to close up shop and encourage us to go second hand/stick with what we have. KH: "It's about covering our body. We need clothes. And fashion employs about a billion people around the world, it's probably the world's biggest industry." KH (who has already earlier denounced modelling in no uncertain terms as 'vile', 'a stupid profession' and 'a meat market'): "Clothes look better on skinny people and crap clothes look OK on skinny people. It means you can get away with anything ... I'm much more concerned about people who are size zero and have no choice. When I was in Mali I met two women who had lost children at the breast because they couldn't feed them." 5) Journo: '...the fashion industry encourages women to buy handbags for Pounds 1,000; an obscene sum of money to spend on something we clearly don't need". KH: "Oh, I don't really care about that. If someone wants to pay it, well, poor them. It shows a lack of imagination I suppose, do you really have so little that you can't think of something more fun to do with Pounds 1,000 than buy a handbag?" (Exactly - if that is what people want to spend on then its their problem. The way I see it our aim is to get them to spend that 1000 on a bag that will actually help someone/not harm the planet/be animal cruelty free. The fact that people are seduced by fashion does not mean those who want to 'clean up' the fashion industry should have suspect or shallow aims). ....and she hardly wears make-up (she particularly dislikes"misogynist" women's magazines which "trade on fear"...Oh my God you can't have wrinkles! You'd better go and do something serious about wrinkles! 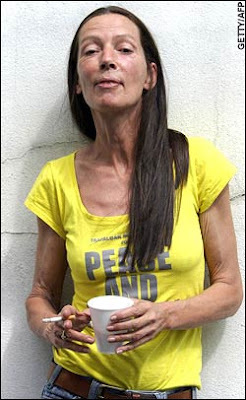 ")...and she still smokes. Way to go Ms. Hamnett.